When receiving estimates for any redesign project, the hope is that enough discussion has been had with an agency so that your overall budget allocated is a healthy one. 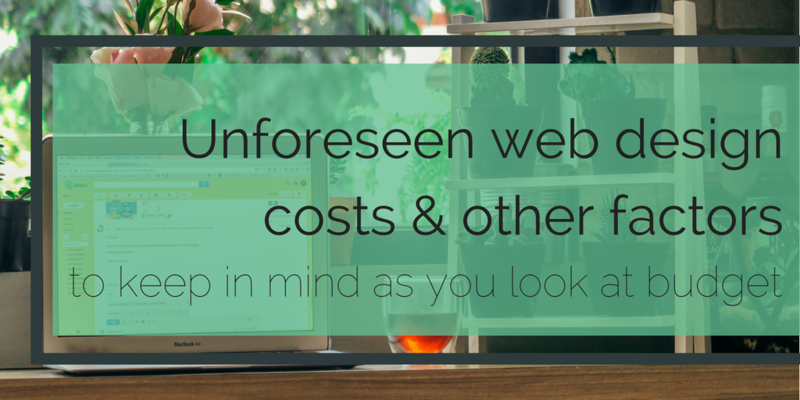 However budgets are of course limited, concessions need to be made, and frankly there is no way you can be made aware of all the potential directions your new website can take within a few discovery meetings. Below are a few factors you may run into mid-project that end up impacting the overall scope of the project. Either from years past or because they are not publicly visible, there often are pages on your site that you'd forgotten about. Ideally that means they aren't necessary, but occasionally those need to be taken into account. To ensure this doesn't happen, crawl your existing site to get an inventory of all the pages and be sure to comb through your site for all needed functionality. Before jumping into a website redesign, do you have high quality brand assets and guidelines? Having to determine an entire new set of fonts or colors, needing to pay for additional photography, or having to recreate your low quality logo file can be very costly. If you don't have brand guidelines in place or want to change direction, be sure that your agency has time built into the budget for brand exploration. In reality, this is almost an entirely separate project so the price tag can be hard to swallow. Keep in mind that a really solid brand will pay dividends down the road as you create new marketing collateral, both on and offline. Our client, Idealware, wrote a great post called, "Lessons Learned From Our Website Content Migration." This came right after we helped them to launch their new WordPress website. Of course, like any project, there are a few hiccups along the way and I think their team outlined it well. Typically professional copywriting and content migration is one of the first budget lines removed when trying to cut down on costs. Everyone assumes they can get it done internally. However, this process is incredibly time consuming. Plus, not having a thorough content process during the redesign can really delay a launch date and clients often end up paying copywriters as crunch time hits. Consider either building content into the budget or commit to dedicating internal resources to the cause. This goes the same for migrating blog content and content entry / formatting. *Pro tip: Paying an extra one or two thousand dollars for authentic photography can make all the difference with a design. If needed, prioritize photography over other features – you won't regret it. As technology has progressed, less custom development is needed and we are often connecting systems to one another. This is especially prevalent with email marketing software such as Mailchimp (learn more about our email marketing software top pics) or a CRM such as Salesforce. Be sure to be clear about what systems you use internally so that the proper time is dedicated creating an integration plan and connecting to those systems. Building those connections between systems can really increase your internal efficiencies but this step is often either forgotten about or downplayed during the discovery process. Of course, no project is smooth from beginning to end. Be sure that your agency has an accurate picture of what your needs are and be ready for how within any project, new ideas and requirements are going to pop up.